Canada's Tessa Virtue, Cassie Sharpe, and Phylicia George are just three of the many female athletes who have won medals at the 2018 PyeongChang Olympics. It's no surprise that Team Canada's female athletes are just killing it at the PyeongChang Olympics. Sure, we've had a few disappointing moments — such as Thursday's heartbreaking shootout loss to Team USA (although a silver medal is nothing to scoff at), and missing the podium in women's curling for the first time. But our female athletes have also made history. Tessa Virtue and Scott Moir became the most decorated figure skaters in Olympic history, for instance, silver medallist Brigette Lacquette is the first Indigenous woman to compete on Canada's women's ice hockey team, and figure skater Kaetlyn Osmond's bronze medal win boosted Canada's medal count to an all-time high for the Winter Games. As of Friday morning, Canada had won 27 medals at the 2018 Olympics, and 17 of those were either from women's events or mixed teams. Gold medalist Cassie Sharpe of Canada celebrates after her win during the Freestyle Skiing - Ladies' Ski Halfpipe Final at the 2018 Olympics. Cassie Sharpe won gold in the women's ski halfpipe after nailing all of her tricks for an opening score of 94.40, and topping that with a 95.80 in her second run. It was her first Olympics. The 25-year-old from Comox, B.C., has been skiing since she was 11 years old and won her first halfpipe competition in 2012, according to Olympic.ca. Her role model is Sarah Burke, who "pushed for equality for women in the male-dominated action-sports world, and advocated for halfpipe skiing and slopestyle to be included in the Olympics," the Toronto Star writes. Burke died in 2012 at age 29 from injuries sustained during a fall in training. "I would not be doing these tricks if it wasn't for her pushing it before I even got into it," Sharpe said. "She was such a pioneer." Canada's gold medallists Tessa Virtue and Scott Moir celebrate on the podium at the 2018 Olympics. Ice dancers Tessa Virtue and Scott Moir won gold after scoring 122.40 points in the free skate for a world-best combined score of 206.07. They also helped secure a gold medal for the team event. They're now the most-decorated figure skaters in Olympic history. They also captured gold in the Vancouver 2010 Olympics, and brought home two silvers from Sochi in 2014. Virtue, 28, is from London, Ont. She started skating at age six and was first teamed up with Moir when she was seven, according to Olympic.ca. Virtue's favourite quote is, "Don't be delicate. Be vast and brilliant." Patrick Chan, Gabrielle Daleman, Kaetlyn Osmond, Meagan Duhamel, Eric Radford, Tessa Virtue, and Scott Moir with their gold medals in the Team Skate on Feb, 12. Ya, the guys were there, too, but damn the ladies of figure skating rocked that team event! Canada earned its first gold medal of the PyeongChang Games in the team figure skating event. Gabrielle Daleman's 37.14-point performance added eight points to Canada's cumulative score, securing them the top spot. Meagan Duhamel and Eric Radford skated pairs, and Kaetlyn Osmond was Canada's entry in the women's short dance. Osmond, 22, and Daleman, 20, both skate in the women's figure skating finals Friday, with Osmond currently sitting in third and Daleman in seventh. Kaitlyn Lawes and John Morris on the podium on Feb. 14, 2018 at the 2018 Winter Olympics. Kaitlyn Lawes and John Morris earned Canada its first Olympic gold medal in mixed doubles curling after beating Jenny Perret and Martin Rios of Switzerland 10-3 in the final. Her mother, brother, and boyfriend were all cheering her on in PyeongChang. "I'll remember having my family here and sliding over the Olympic rings and being able to look up and see their smiling, proud faces," Lawes told CBC News. "That's something that I want to remember for a lifetime and to share that with them is so special to me." Silver medalist Justine Dufour-Lapointe on the podium Feb. 12. Justine Dufour-Lapointe won silver in women's moguls after earning 78.56 points in the super-final. She won gold in the 2014 Sochi Olympics, but said she was anything but disappointed with her 2018 result, according to The Canadian Press. "I feel like I've given everything I could," Dufour-Lapointe, 23, said. "I gave my heart, my fire and the passion for my sport." 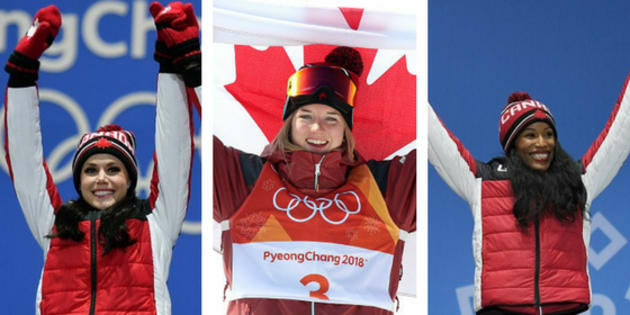 "I skied like a real tigress"
Dufour-Lapointe is from Montreal, and is the youngest of three moguls skiing sisters who all competed at Sochi 2014, Olympic.ca reports. Bronze medallist Kim Boutin on the podium on Feb. 18. You read that right. Speed skater Kim Boutin earned THREE medals in PyeongChang! The 23-year-old from Sherbrooke, Que., captured a bronze medal in the women's 500 metres, a bronze in the 1,500 metres, and a silver in the 1,000-metre short-track. We're not worthy! She started skating at age six because she wanted to follow in her brother's footsteps, according to Olympic.ca. Silver medallist Laurie Blouin on the podium on Feb. 12. Laurie Blouin won silver in slopestyle with a clean second run for 76.33 points, all in high winds that delayed the competition and while sporting a black eye after a nasty crash in a training run a few days previously. "I'm really stubborn," Blouin told The Canadian Press. "I was like, 'I want to compete. I will compete.'" The Canadian's women's hockey team after losing to the United States in the Women's Gold Medal Game at the 2018 Olympics. It was a heartbreaking loss that ended their gold medal streak, but Canada's women's hockey team earned a silver medal after losing to the U.S. 3-2 in a shootout Thursday. It's the first time the U.S. team has been at the top of the podium in 20 years, and it's the first women's final that has ever gone to a shootout, The Canadian Press reports. Melodie Daoust, who was named the tournament's MVP, led the scoring in Canada's games. Daoust, 26, is from Valleyfield, Que. She's been playing hockey since she was five, according to Olympic.ca. Meagan Duhamel and Eric Radford during the medal ceremony for the figure skating pair event at 2018 Olympics. Meagan Duhamel and Eric Radford captured the bronze medal in pairs figure skating, becoming Canada's first Olympic pairs medallists since 2002. They also helped Canada earn a gold medal in the team event. After their pairs performance, Duhamel, 32, dropped to one knee and cried. "I don't think there's been happier bronze medallists than we are," she told The Canadian Press. Duhamel, who is from Lively, Ont., is a proud vegan and has been a certified holistic nutritionist since 2012, according to Olympic.ca. Kaillie Humphries and Phylicia George won bronze in women's bobsled after racing to a time of three minutes 22.89 seconds. It was the third Olympic medal for veteran bobsledder Humphries, 32, from Calgary. Her brakeman George, 30, from Markham, Ont., only took up bobsleigh a year ago, but is a past summer Olympian in track and field, according to Olympic.ca. Humphries is now the most-decorated bobsledder in Canadian Olympic history. Alex Gough during the medal ceremony for the women's luge singles at the 2018 Olympics. Alex Gough nabbed Canada's first-ever Olympic medal in luge with her bronze finish in the women's singles race. She later helped earn a silver medal in the team relay along with single slider Sam Edney and doubles duo Tristan Walker and Justin Snith. This was the fourth Olympic games for Gough, 30, from Calgary. She took up Luge at age 13, and five years later was on the Olympic team, Olympic.ca reports. Gough works with the charity Fast and Female to promote sport involvement for girls. Bronze medalist Kaetlyn Osmond of Canada on the podium. Kaetlyn Osmond won a bronze medal in figure skating after scoring 152.15 in her "Black Swan" long program for a combined score of 231.02. Osmond's win not only boosted Canada's figure skating team to its best-ever Olympic medal count (four medals — our previous best was three at the 1988 Calgary Games and the Sochi Olympics four years ago, Canadian Press reports), but it bumped Canada's total medal count to an all-time high of 27. The 22-year-old from Marystown, N.L. nearly quit skating after a series of injuries (including breaking her leg in two places during a practice) threatened to derail her career, but she fought her way back. Gold medalist Kelsey Serwa of Canada on the podium. Kelsey Serwa won a gold medal in women's skicross — her second Olympic medal after winning silver in Sochi in 2014. Everything today went perfect," Serwa said after the run. "It went to plan, I executed." The 28-year-old from Kelowna, B.C., has been skiing since she was two, according to Olympic.ca. She said she always taps her poles twice before getting in the gate to get her mind into racing — a superstition that's been paying off. Canada's silver medalist Brittany Phelan poses on the podium during the medal ceremony for the freestyle skiing Women's skicross during the PyeongChang 2018 Winter Olympic Games on Feb. 23, 2018. That's right, Canada was 1-2 across the skicross podium after Brittany Phelan won a silver medal. The 26-year-old from Mont-Tremblant, Que. actually made her Olympic debut as an alpine skier at Sochi in 2014, but decided to try ski cross later that year, according to Olympic.ca. A calf muscle injury solidified her decision not to return to alpine racing. "It's been such an amazing day," Phelan said after her race. "To finish second behind my best friend and someone who's really taught me everything — it couldn't have gone better."